The bird's owner has yet to come forward. Police in the village of Coningsby, in Lincolnshire, had to deal with a rather unusual call out. A runaway ostrich was causing a road hazard near the local RAF base on Wednesday morning and officers were sent out to deal with it. However, the bird refused to come quietly for PCs Gary Young and Tom Harrison, with a spokeswoman saying it "put up a fight". Thankfully, PC Harrison "has experience with poultry", the spokeswoman told BuzzFeed, which apparently may have helped the officers as they eventually managed to corner the ostrich. However, they were then told the police van they had called for as back-up was unavailable so had to put the large bird in their patrol car. The spokeswoman told Boston Standard: "They didn't have to open the sunroof as the bird is not quite as big as a full-size ostrich, but we were disappointed they didn't get a selfie of them with the bird in the car." 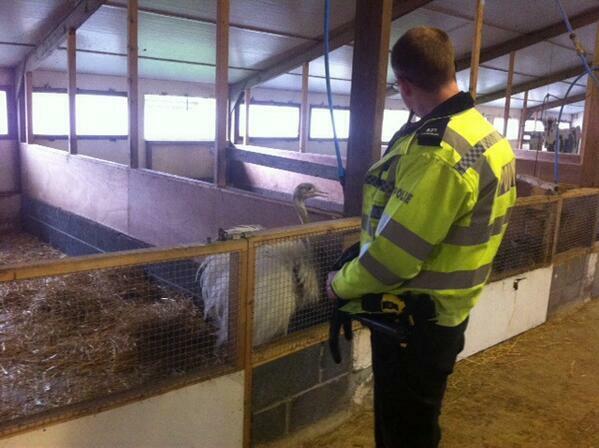 The ostrich has been taken to Tattershall Farm Park as police continue to call for the bird's owner to come forward.